Lightweight design allowing the user to move around freely throughout the day. Lined with breathable material for improved user comfort and reduced odour build up. The steel toe cap and steel midsole provides exceptional protection. Oil resistant with a rubber protective outsole. Dickies Daytona FD23330 Graphite Hiker Boot conforms to EN345 Safety Standards. Dickies Safety Dealer Boot are made from a goodyear welted full grain leather. Elasticated sides make them easy to put on and remove. Cambrelle lining and a high density foam insock. They include nitrile rubber outsoles which are heat resistant up to 300C. Inside they are reinforced with EN20345 standard steel toecaps and midsoles which offer superb penetration and toe protection. Bama SOKKET EXTRA – there exists nothing superior for wearing of rubber boots. The proven 2-layer thermo system ensures a good and natural air-condition. The cushioning acrylic inner layer carries off the foot moisture. The foot remains dry and warm. The cotton outer layer absorbs perspiration. To be worn with or without socks. Also liked as warming house slippers. Highly durable and extremely dependable overall. Two durable knee pad pouches suitable for dickies knee pads. Manufactured with 9 pockets to hold tools, pencils and other belongings. Produced from 65% Polyester and 35% Cotton. Manufactured from 65% Polyester and 35% for both comfort and durability. Designed with two swing pockets that have side access. Utilizes a concealed front stud fastening system. Other pockets include: Two chest pockets, One back pocket, tool pocket and a rule pocket. The elasticated waist band helps maintain a comfortable and secure fit. Dickies Redhawk WD4829 Stud Front Overall with Knee pad pouches. A fantastic Dickies WD4829 coverall, good value overall which is ideal for everyday use. The best choice for mechanics and engineers, with concealed stud fronted pocket design, which will prevent scratches to paintwork. Coverall with side elastication for a comfortable fit. Dickies IN4001 Industry 260 Bib & Brace Overalls Grey/Black, Size - 36"
Dickies IN4001 Industry 260 Bib & Brace Trousers have an adjustable waist that for a secure, comfortable fit. It includes multiple storage pockets for easy item storage throughout. Ideal for working in many industries including construction or general duties. Dickies Industry 260 Bib & Brace Trousers are made from 65% polyester, 35% cotton. 260gsm fabric. Available in size 36" only. Dickies WD4839 work wear Coveralls are amongst the most popular in the UK market. Overalls with a very strong two way zip and studded over placket. WD4839 includes two very handy zipped chest pockets, easy to get to tool pocket and rule pocket which is located nicely to the outside of the leg. Swing pockets with side access, and a pencil pocket on the sleeve. Dickies WD4839 Redhawk Overall includes two knee pad pouches to fit your knee pads and will protect your knees at work. The Dickies is quality workwear brand, which is why customers continue to comeback, because of quality and reliability of their products. The fabric is treated with Teflon which is durable to washing and dry cleaning. The WD4879 has reinforced stress points. It has side elastication, with tunnel waistband, and an action back for freedom of movement whilst working. Heavy duty YKK brass zip front. Two swing pockets with side access slits. Two mitred back pockets, one with zip closure. The Dickies WD4879 Deluxe Coverall is made from lightweight 280gsm 65% Polyester / 35% Cotton with Teflon coating 280g/m² fabric. Provides superior protection against heat and flames which makes them perfect for welding. Approved to level 2 high visibility protection EN471:2003 Class 3 Level 2. Side swing pockets for easy access to tools and valuables. Designed to last with reinforced stress points improving durability. Manufactured with 100% Flame retardant cotton. Dickies Fr4870 Hi Vis Flame Retardant Coverall conforms to EN471:2003, EN ISO11612:2008 & ENISO 11611. The ultimate work coverall made with a lightweight fabric to increase your comfort. Designed to give you freedom of movement and added visibility thanks to the reflective strips on shoulders arms and legs. Stud fastened collar and stud fastened cuffs. Fabric: 100% cotton 170 g/m², Industrial laundering allowed. Dickies WD2279LW Lightweight Cotton Coverall available in size 2XL only. This flame retardant overall has safety with the benefits of high visibility. These coveralls provides Class 1 flame protection. Ideal for workplaces where flames and sparks are near. It's also reinforced at the key stress points, with elasticated sides. Conforms to EN11611 & EN11612:2008 Saftey Standards. Manufactured from 100% cotton making this coverall incredibly comfortable. Designed with two slanted chest pockets ideal for holding the users valuables. Other pockets include, Two back pockets, tool pocket and a rule pocket. Nylon zip fastening system, maintains a comfortable and secure fit. These superlightweight overalls are easy to pull on. This airy garment protects from flames and sparks without burdening you. They don't just keep you safe either - these coveralls also keep you seen. Equipped with a host of high visibility strips, they include one on each arm and leg as well as one over each shoulder. This is Pyrovatex-treated 100% cotton. 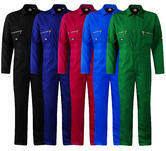 Its a flame-retardant overall that will keep you protected at all times, and comes with a slew of thoughtful features. For starters, there's a heavy duty two-way brass zip, as well as an action back, studded neck closure and triple-stitched seams. Reinforced stress points throughout impart the desired durability. When it comes to storage, there's no shortage of pockets to choose from. A pair of zippered chest pockets are complemented by a set of covered back pockets as well as a pen and rule pocket. 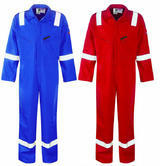 This high quality coverall provides maximum protection against flames and heat. Manufactured with flame retardant reflective tape strips for hi vis functionality. The extended collar provides additional protection to vulnerable areas (neck & throat). Durable construction with triple stitching on major seams. Manufactured from 100% cotton with FR treatment. The Elasticated sides allow for a more comfortable and secure fit. Manufactured from 100% Cotton with Pyrovatex FR treatment, 350g/m² Fabric. Dickies Wd5050 Pyrovatex Firechief Hi Vis Coverall conforms to: EN 11611:2015 Class 1, A1 EN ISO 11612:2015 A1, B1, C1 with FR treatment. 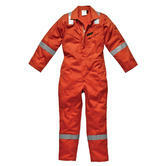 Heavyweight cotton fire retardant coverall providing maximum heat & flame protection. The extended collar provides extended protection to vulnerable areas such as neck & throat. Triple stitched seams for added reinforcement extending product life. Highly visible reflective strips on shoulders, arms and legs. Generous action back for ease of movement. Reinforced construction with feldlock triple stitching to major seams and bar-tacks to stress points. 2 back pockets & flexible rule pocket with safety gusset feature. High quality and long lasting, two way YKK zips, Side access pockets allowing entry to undergarments. Fabric: 100% cotton with Pyrovatex FR treatment 350g/m². Dickies Fr5402 Pyrovatex 100% Cotton Hi Vis Coverall conforms to EN ISO 11612:2015 & EN ISO 11611:2015. Dickies GR43100 Grafter Black Cargo Trousers, Size - 44"
Available in size 44" only. Dickies Redhawk Super Work Trousers come loaded with deep pockets and a hammer loop for carrying all your essential equipment. Triple stitched seams also guarantee great durability. Our top selling work trousers, these trousers are fantastic value. These trousers include may great features that are very popular . Versatile and practical, they will give you long lasting protection against the elements. Dickies Redhawk Super WD884 Trousers made from 65% polyester, 35% cotton. Known as drivers’ trousers, they feature two front pockets and one buttoned back pocket. Dickies WD864 Redhawk Trousers are made from a 260gsm polycotton fabric It includes 2 front pockets. Two zipped back pockets to secure your items. Button and zip fastening give a secure fit. External knee pad pouches make it easy to pull kneepad in or out. Made from 65% polyester, 35% cotton. Designed specifically to fit a female figure providing a secure fit and comfort. Fitted with knee pad pouches that can hold all generic styled kneepads for knee support. Secure fit with a zip fastening system finished with a metal button. Multiple pockets for holding all sorts of possessions from tools to valuables. Manufactured from 65% polyester & 35% cotton canvas. These ladies work trousers have a slightly loose fit and are designed to fit on your waist. They feature 6 functional pockets; hip pocket, cargo pocket, 2 front pockets, 2 rear pockets. An excellent, value driven offering, engineered with Dickies quality and performance. Manufactured from 65% Polyester and 35% Cotton providing comfort and durability. Designed with belt loops to ensure an even better fit if necessary. Two front pockets ideal for holding the users valuables. Smart, formal design perfect for working in offices. The Grafter Trousers from Dickies are one of the toughest money can buy trousers. They incorporate high performance extremely resistant to tearing, scuffing and abrasion nylon based Cordura fabric - which providing top performance in all aspects of work. With multiple pockets and triple stitching throughout, durable Dickies Grafters trousers won't let you down. Extremely durable fabric 100% cotton. 290gsm with Nylon Cordura knee pad pouches. Williamson Dickies started out in Texas 100 years ago. Today, the iconic Dickies horseshoe logo and workwear is in 100 countries worldwide. Bravo Dickies! Dickies workwear - such as the famous Dickies Redhawk trousers - is so established that it has now become an icon within mainstream casual/fashion wear. Dickies workwear offers a wide range of protective clothing. This is researched, designed and engineered by innovators of the industry. Rest assured that these garments meet and exceed current International Safety Standards. Dickies Redhawk mens work trousers are probably the most iconic, original, rugged, working trousers. We sell volumes of these in navy and black, especially the Dickies WD884 Trousers style: triple stitched and with the knee pad pockets. The Oil and Gas FR workwear collection is a new move for Dickies. It is designed for use in upstream and downstream oil and gas facilities with specific demands for flame retardant (FR) garments that are comfortable and with minimal shrinkage. At NorthSeaWorkwear, we couldn’t miss the opportunity to offer you the Dickies’ experience. 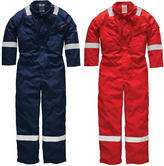 Dickies overalls - these are Dickies Redhawk polycotton boilersuits and coveralls. Dickies T shirts, belts and accessories. Our best sellers are the Dickies Eisenhower work trousers and the Fire Chief FR coveralls. Take a look at our Dickies grouped deals: even better value for your money.